I don’t talk much about my afternoon class – we only meet once a week for a few hours. The style of the class is similar in professionalism, just a little more relaxed since we try to cook and eat in the two hour period. There was a recent request to work with fondant, so I managed to get some in the house this week. It is very fun roll to out and lay onto a buttercream filled spongecake and decorate. 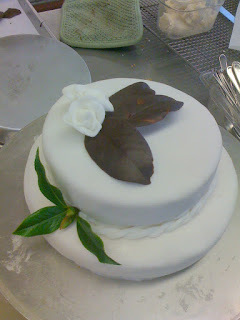 We also made chocolate leaves using camellia leaves as templates. Two hours sped by quickly. This is the first version of the cake. After showing it off, we came back and decorated it further with chocolate curls and a dusting of powdered sugar, took pictures, and then promptly cut it up to eat. I am very proud of the students working steadily through the project – even though it is all gone, what a great sense of accomplishment! P.S. Cake walk is a term that infers doing something is easy (“it’s a cake walk”) or, if you’ll forgive the parallel terms, “a piece of cake.” Originally it was a form of group dance that civilized people of moderate means did as a polite activity while socializing. Sometimes it was easy, sometimes not, but you always made it look like it was easy. Just like these students did this week.